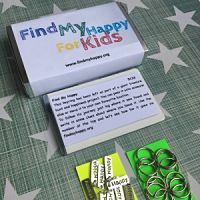 Find My Happy was created to put little pockets of happiness and joy into people’s lives. 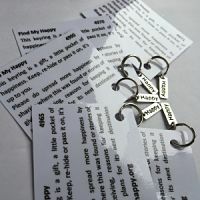 These pockets of happiness start with a handmade “happy” keyring and tag with a description of what it is and are just left in random places for people to find. When found they can be kept or re-hidden, a pocket of happiness that can be spread far and wide. Please select which option you want to purchase below and press "Buy Now"
Since Find My Happy started (in Surrey, United Kingdom) the keyrings have now reached as far Australia, Caribbean and America plus many European destinations. As a result this little happy project has been in the local news. 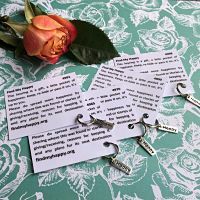 The keyrings originally started as just a way of sharing a little moment of happiness, as a coping mechanism for losing my Mum and the need to share her happiness concept. The concept being that no matter how tough the day or time in your life might be there are ways of enjoying little pockets of happiness. Look out for “happy” keyrings and please do contact me if you find one or want to get involved.